Gray skies, ominous clouds, constant drizzle and a whippy little wind - not exactly the conditions that make you want to drag the kayak to the water. 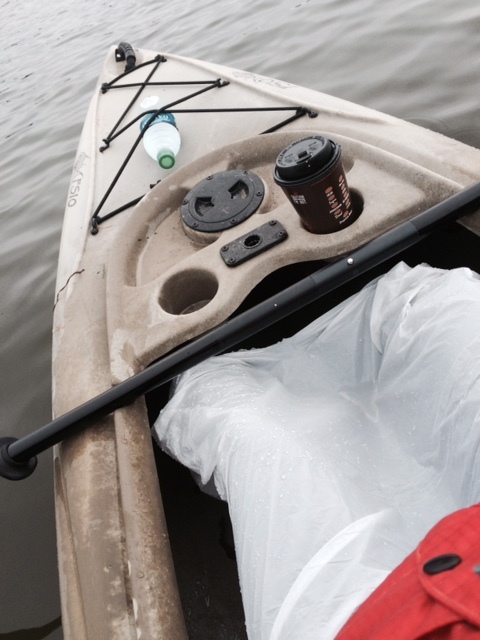 But when you have a training deadline of a three hour paddle due - and an insane work week ahead that is more portentous than the skies above, you pull on your big girl pants (or in this case a trash bag) and hit the water. Does this garbage bag make me look trashy? I'll admit it, I wanted to stay in bed. A cool rainy Sunday and my family all tucked-in tight and still snoozing was pretty hard to resist. But The Hubs had been awesome enough to drive up to the lake the night before and dump all the rain out of the boat. I'm strong - but not pull-a-kayak-full-of-rain strong. Luckily, he is. 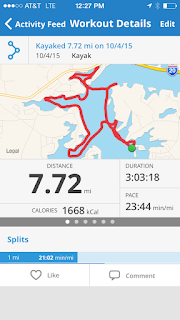 So I'm a person that needs a destination as a goal, and I wanted to paddle in the river current, so I decided to ignore the dark gray clouds and head towards the river section of the lake. And of course the further away I got from the safety of our bay and dock, the darker, windier and chillier it got. I just gave myself short assignments like paddle hard as you can until you reach x. Or don't stop until you round the bend. Really the clouds were mostly all bark and just a little bite. I got rained on maybe about 10-15 minutes, and that was of course timed for right when I was out in the middle of a main channel. Thanks to a garbage bag as a skirt, most of my legs stayed dry. Only flaw to that plan was the occasional runoff water that slowly drenched my shins/socks/shoes. By the time I reached the safety of a cove, the wind had died down and the rain was reduced to a mist. I was one hour in but really needed to cover new ground (or water) if I wasn't going to go bonkers with this assignment - so I headed back into a section of the lake that I had never explored. I had the best time! As soon as it was "new" scenery the time/miles started ticking by. I stopped paying attention to the weather and started enjoying the rarity of being truly alone. I'm not alone very often, and it's not something I seek out very often. But today, although I knew I was kayaking alone, it didn't occur to me that I was alone for the first 1.5 hours. My thoughts were so busy with worry about conditions, where to go, how much longer, what all was I going to have to get done at work this week and the family back at the house. So it's funny that the next 1.5 hours went by too quickly. I was actually sad the last 30 minutes, because I wanted to stay out on the water. 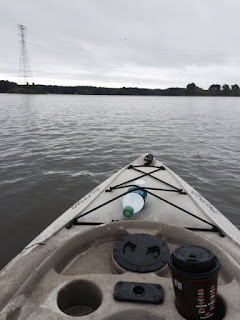 I startled countless herons, paddled through grassy areas and became super curious about a few islands that are filled with bird houses - I even managed to run aground once b/c I was too busy looking around to notice that I was running out of water. The end of the paddle, I was stoked for a few reasons. 1. I had completed the assignment. 2. I didn't let weather deter me. I'm not going to be able to control weather conditions in the Keys in November so why let weather impact training. 3. Three hours in and I felt great! Other than being hungry - I could have kept going. So many people have been really encouraging to me these last few weeks. But I have certainly run into critics as well. Amazing how people feel entitled to share their opinion about my life, but I guess that is the trade off to sharing on this blog. Of course people will have opinions, but when brought to my attention, I will address. I've been told that I'm selfish for the time and money away from my family for this trip. But I would argue differently. The hours and miles spent training for the Grand Canyon are some of the best memories I have with The Hubs, b/c he did all the training hikes right along side me. And he taught me. I had never really hiked. I wasn't "outdoors" type. When I announced that I wanted to hike the Grand Canyon, I had lived most of my life indoors. I was completely over my head, and he taught me how to be comfortable outside. We paid a fortune in babysitting back then, but my children had a blast with their sitters. It was really a win/win. But it's more than just QT during training. I've learned so many life lessons from preparing for endurance events and so much about myself through these trips. I'm excited to go on another adventure with Project Athena Foundation. Instead of being viewed as selfish, I'd like to think that getting up on a rainy Sunday because A). I have made a commitment with stated goals and B). I am striving for an active/fit lifestyle are both positive examples for my children. As for the money - we could all easily make a long list judging each other how we manage our finances, but the truth of the matter is this event is a priority for my family. My husband doesn't just simply go along with these things, he wholeheartedly encourages it (because he's awesome). Some may spend hundreds of dollars aimlessly shopping for anything/everything; we spend it on gear/supplies for activities, gym memberships and crossfit classes. One isn't better than the other, except one is what works for you and the other is what works for us. And the bonus to all my "selfish" activities is that my children are exposed to these activities and are becoming involved. My four year old can out-hike most kids twice her age. My 8 year old is pretty awesome managing an adult-sized kayak. So with that, we feel good about the time and money spent as a family. My weekend may look different from yours, but that doesn't make me selfish.